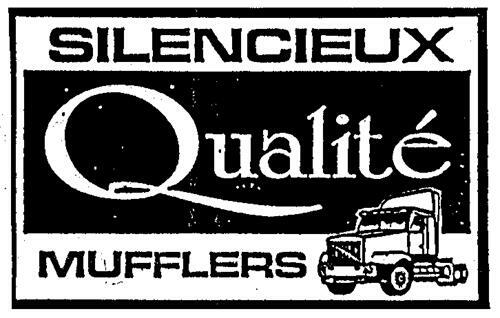 On Wednesday, July 16, 2003, a canadian trademark registration was filed for the above pictured logo by Silencieux Qualité Inc./Qualit 4005 Boul. des Grandes Prairies, Montreal, QUEBEC, CANADA H1Z4M8. The Canadian IP office has given the trademark application number of 1184704. The current status of this trademark filing is Registration published. The correspondent listed for is CUCCINIELLO CALANDRIELLO S.E.N of 1980 SHERBROOKE STREET WEST, SUITE 400, MONTREAL, QUEBEC, CANADA H3H1E8 The trademark is filed in the description of Clothing, namely baseball caps, sweaters, T-shirts, golf shirts, uniforms, polo shirts and jackets; key chains; cigarette lighters; stationary, namely, letterhead, envelopes and business cards; posters. , Manufacture, distribution and retail of exhaust systems, pipes and components as well as parts for heavy duty trucks; manufacture, distribution and retail of exhaust systems, pipes and components for light duty trucks and passenger vans; manufacture, distribute and retail of catalytic converters and resonators; custom bending and custom manufacturing for heavy duty trucks, light duty trucks, passenger vans and stationary machinery. .